How will a lay audience understand ‘four dimensional spacetime’..? The easy thing is to visualize a four headed Brahma. How do we say Rudras/force-fields manifest in the Brahma/spacetime..? The picturization is one Rudra came out of Brahma’s head, another came out of nose, another out of feet etc. This goes on and on and on.. Every puranic, popular description of a diety that does not make sense outwardly, actually conveys a science based description of that ‘force’ or ‘divinity’. But with understanding of Standard Model, I can see a huge similarity between Vedic divinities and Standard Mdoel force-fields. It is not just in the forces but also events described are very similar to those events at the origins of Universe. All Puranas and itihasas like Ramayana and Mahabharata say Rudras are eleven in number. But their names vary hugely. There are no standard eleven names. But as I went through the names of Rudras, I could easily classify them into eleven distinct groups using the force-fields that existed in Standard Model. Rudras are force-fields that manifested in inflated/expanded spacetime/Brahma at different points of time. Standard Model talks about these seven force-fields that manifested at different points of time in the Universe. 11. A force-field that shortens the Fifth dimension (Brahma’s Head that is cut -off by Rudra) which in my view could be the source of Quantum Entanglement. Such a fifth dimension was proposed by Einstien too. Note that Gravity is not a force-field in all of the above. It is only a spacetime warping manifestation. Brahma the expanded spacetime post cosmic inflation epoch, getting impacted by force-fields is the ‘Gravity’. In this Brahma manifests the Rudras. But Brahma (Gravity) is not a Rudra (force-field) at all. There are two color schemes that exist. An additive color scheme based on Red, Blue and Green. On a black background, additions of Red, Blue, Green make all other colors. This is used in our monitors, TVs etc. Another is a substractive color scheme based on Magenta (Purple), Yellow and Cyan. On a white background (where all colors exist), one by one colors are subtracted (removed) and newer colors formed. This is used in Printing. Universe’s fields diverged from an Integrated field. For e.g standard model says from an unified Strong-Electro-weak force Strong and Electro-weak force separated. Then Electro-weak force separated into Electromagnetic and Weak force. This is akin to a Color subtraction model. The three basic colors in this scheme are Yellow, Magenta and Cyan. The first Rudra that originated in the expanded Spacetime, Brahma, is the black one. It is kAla. Let me describe it in the end. Then another rudra originated in the Brahma. This is the ‘white’ one. He was called Virupa-aksha, meaning ‘multiple/variety of cores’. Virupaksha Rudra is always depicted in White color. This Rudra is white color because from this Rudra three other Rudras emerge. Even he did not further the evolution. In Standard Model, at first a Unified field of Strong-Electromagnetic-Weak force emerged. VirupAksha Rudra is this EWS Unified force-field. Then this virupAksha Rudra split into three different rudras at different points of time. These three Rudras became the controllers of the Universe. Since virupAksha Rudra originated those Rudras that controlled the Universe VirupAksha Rudra is also called Isana Rudra. iSAna Rudra is colorless. After White light splits into its component colors, what remains is colorless. Thus VirupAksha Rudra is what exists before the force-fields split. iSAna Rudra is what remains after the split. They are one and the same. There is no ‘mriga’ that is not pierced by the components of this force-field. Hence this Rudra is also called ‘mrigavyAdha’. ‘Mriga’ are all those particles that ‘move’. The components of EWS are Electromagnetic, weak and strong force fields. These three fields control the evolution of the Universal matter, and matter’s life and death. Hence it is called ‘iSAna’ rudra, the controller. The White Rudra splits into Red and Bluish-Green (Cyan) Rudras as white color splits into Red, Blue and Green. One Rudra that originated from the VirupAksha/isAna/mrigavyAdha Rudra is the vilohita Rudra. Vilohita means very deep Red. This vilohita Rudra is also called Vrsakapi. In Rg Veda, the soma-less Vrsakapi’s head is said to have been split from the body and that splitting leads to bonding between Indrani and Indra. Kapi means red or reddish brown. Vrsa-kapi means strongly Red. When the Electro-weak force-field splits into Electromagnetic and Weak force-fields, the Electromagnetic force-field bonds the Indra (baryonic nuclues) and Indrani (electrons moving around the nuclues). Vrsakapi is soma-less or strong-force less, because Electro-weak force obviously does not have Strong force (Soma) in it. This Rudra is also called Pinakin. Pinaki is said to be the ‘Bow of Shiva’. From this bow of Shiva three different arrows are sent out. Hence sometimes it is also represented as ‘Tri-Shul’ of Shiva. Pinaki is red in color. The three arrows are Electric, Magnetic and Weak force-fields. The arrows from the bow of Shiva give death. Hence this Rudra is also called mrtyu Rudra. These are said to pierce every matter and being in the Universe and cause annihilation and decay. In languages like Tamil, ‘Shivam’ means Red. As one could see here, the Vilohita, Vrsakapi and Pinakin Rudra lead to more Rudras. Hence these are the Electro-weak force-fields which further split into Electromagnetic force-field and Weak force-field. The color of Red splits into Magenta/purple and Yellow. As the Red color splits into Magenta/Purple and Yellow, from this vilohita (Red) Rudra, two other Rudras emerge. Yellow is Pingala Rudra, which is the Electro-magnetic force-field. Since Electric and Magnetic force-fields always manifest together, they are called ‘twin-headed’ the ‘Asvins’, and ‘sons’ of Rudra. Magenta/Purple is nilalohita (Bluish Red) which is the Weak force-field. Yellow is Pingala. Pingal means Yellow. Our Sun is a star that has a color temperature of 5780 Kelvin. For a star of this temperature the peak wavelength in the visible spectrum is around 501 nm which corresponds to green color. But a measurement of the spectrum at sea-level indicates that we receive peak solar energy at 570nm, which is yellow color. This is the reason why people say Sunlight peaks at Yellow color. This yellow color is called ‘Pingal’. This Yellow color is used to denote the electromagnetic field. The force-field of Electromagnetic Radiation is called Pingala Rudra. Yellow Color is a combination of Red and Green. Red and Green combination can lead to variety of colors from brown to yellow depending on ratio of red and green. Hence Pingal is also used to denote brown, reddish brown etc. The EM radiation we receive from sun is maximum at Yellow and Green spectrum. The Yellow-Green combination is called Harita. Hence our Sun’s EM radiation is called ‘Harita’ Asva. We saw in the previous posts that Asvin is EM field and Asva is EM radiation. This Electromagnetic force-field is the reason for all atoms, elements, compounds, molecules and living beings. It is life giving. In the ‘Nadi’ system, the ‘Nadi’ that gives life is called ‘Pingala’ Nadi. Pingala, the Yellow Rudra is the Electromagnetic field. This Rudra is also called ‘Revata’ or ‘Raivata’ Rudra. It means ‘Shining’ Rudra as Electromagnetic force-field causes Light. This Rudra is also called ‘Sarpa’ Rudra. Sarpa means that creeps or that moves the fastest. EM force-field facilitates the fastest movement. This Rudra is also called ‘SadyojAta’. ‘SadyoJAta’ means the most recently born. The most recently born force-field in the Universe is the Electromangetic force-field. Nilalohita means combination of Blue and Red which is magenta or purple. This magenta or purple is the ‘Weak’ force that decays all the matter in the Standard Model. Standard Model describes a force-field that is destructive, decays all partices of Dirac-Fermi field. This force-field has a very limited range. If it had a long range then there would be nothing in this Universe as all matter would have decayed. Since it has very limited range, it is called ‘Weak force’ in the Standard model. Samudra Manthan is the event of Electro-weak symmetry breaking and Higgs mechanism. The ‘HalahAla’ poison that evolved during Samudra Manthan is the Weak force of the Standard Model. In the Puranic depictions purple (deep purple) is depicted as the color of ‘Halahala’, a poison that evolved during Samudra Manthan. This force becomes weak because Vishnu, the higgs field ‘wakes up’ and interacts with weak force-field and makes the weak force bosons ‘massive’. This is explained in the stories of matsya, hayagriva which I explained before. As weak bosons become massive, their momentum goes down or gets reduced. As their momentum gets reduced, the weak force-field range gets severely limited. Momentum is Shakti. This is depicted as stories of Shakti (Parvati) holding the throat of shiva (stopping the momentum or flow) and thus limiting the range of hAlahAla poison to a narrow range. The ‘nectar’ which the matter particles (of dirac-fermi field) drink to become ‘immortal’ is the Higgs force-field. With Higgs mechanism their motion is impeded, particle acquire mass, they start binding and forming larger structures. Higgs is the reason why we have ‘immortal’ protons and all the atoms in the Universe. Ofcourse Vishnu, the Higgs field gives it to matter particles (devas). This is how cosmic events got interpreted in puranic times in variety of ways. The White Rudra, VirupAksha, which is the Unified EWS field splits into Red (vilohita) and BluishGreen/Cyan (shyAma or light colored) Rudras. Vilohita is the Electro-weak force-field which splits further into Electromagnetic and weak force fields. In the United Strong-Electro-weak force-field, the first one to diverge is Strong force-field and hence usually written at the left-most corner (Strong-Electro-weak force) in the writing convention. Hence the strong-force-field is called the ‘LEFT’ side Rudra. Electromagnetic and Weak force-field are the RIGHT side Rudras. Strong force-field is bluish-green in color. It is shyAma. ShyAma is depicted as grey, black, bluish-black, green, bluish-green etc. But shyAma is light-colored in the blue-green spectrum. It is cyAn. 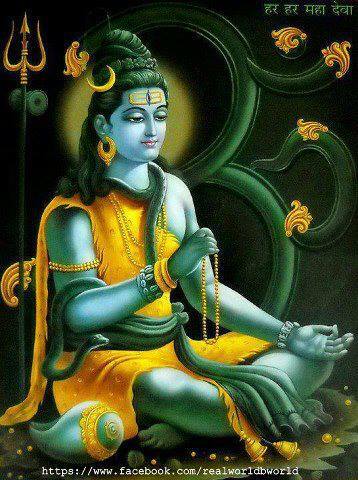 Shambhu Rudra is the strong force-field. Sham-bhu means manifesting steadily or establishing. ‘Zam’ is interpreted as ‘coming to rest’, ‘being satisfied/happy’ etc. It is actually coming to steady-state or establishing. Shambhu means a steady state manifestation. In the standard model, the first force-field to establish (and that establishes other steady state quarks) is Strong force-field. Hence it is the ‘Sham-bhu’ rudra. This Rudra is also called ‘vAma deva’ Rudra or the LEFT side force-field. According to Standard Model, Strong force is the first force-field to diverge or the first Rudra to be born. Hence this Rudra is called the ‘Jyestha’ the first one. vAma deva Rudra is at times indicated by blood-red color. Blood red color is the complementary of Blue-green. If Cyan ( a light color) is what is given out, then Red (a dark color) is what is absorbed. Hence vAma Deva Rudra can be indicated in Red color, depending on the context and convention of color used. This Rudra of Strong force-field is also called ‘pashu-pati’. In the previous posts, I described how ‘GA’, the four legged cows indicate the strong force-field. Pashu is another name for GA. The first Rudra that originated in the Brahma, the expanded spacetime, plucked out the fifth head of Brahma. He was unborn with only one part, Aja-ekapat, and remained kAla, the black one. Brahma, the expanded spacetime remained with four heads since then. Einstein proposed a fifth dimension to spacetime (Brahma) which he said is very short. In my reading of vedic scriptures, this fifth dimension is what is causing the phenomenon of Quantum Entanglement. The force-field or rudra that manifested on Brahma (expanded spacetime) has indeed plucked the fifth head or suppressed that fifth dimension. This suppressed fifth dimension is the source of Quantum entanglement of properties of particles. More on it later. Hence this rudra is called kAla or kAla Bhairava. Of the Ashta Murthis or eight bhairavas, kAla Bhairava is the black bhairava. Bhairava rudra means the most formidable force-fields. This Rudra is also called Aja-ekapata Rudra. EkapAt are those that are their own anti-particles. For eg. Photon or Higgs Boson. Aja-Ekapat is the particle of this QE force-field which remains unborn. At this point, it is my supposition and a psuedo-science. This Rudra or force-field is mostly known as ‘kapardi’ Rudra. Kapardi means ‘entangled hair’ or ‘matted hair’. As this force-field or Rudra is the source of entanglement of quantum properties of different particles, this Rudra is called ‘kapardin’.